The Wyoming Department of Transportation (WYDOT) has a roadway project planned for 2023 for Main Street from Burkitt Street to Dow Street. WYDOT is partnering with the City and Community Builders through the Downtown Sheridan Streetscape Project to explore potential improvements. The Streetscape Action Plan is scheduled to be considered for acceptance by the City Council on December 17th at their regularly scheduled City Council meeting. The Council will receive a presentation on December 10th from City Staff and the consultant summarizing the plan contents; the public is welcome to attend the work session meeting on December 10th at 5:30 PM. No action is taken during a work session. The City Staff will not advocate for any specific lane configuration option, but rather will provide facts and facilitate opportunities to test alternative configurations if desired by the City Council and the public. The City Council’s acceptance of the plan does not obligate the City to perform any of the suggested changes in the plan, but rather the acceptance acknowledges the final version of the plan and deems the work of the consultant complete on this project. To our delight, the consultant, Community Builders, has expressed an interest and desire to remain engaged and support our efforts beyond the plan’s acceptance and thus will be available on a limited basis to assist with future questions surrounding the plan’s ideas and strategies. 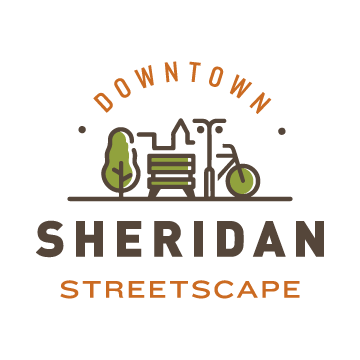 The City of Sheridan has recently received the draft Downtown Sheridan Streetscape Action Plan from our consultant team. The Sheridan City Council is tentatively schedule to consider and accept this plan at their late September Meeting. Comments and suggestions can be directed to Brian Craig (bcraig@sheridanwy.net). Additionally, there will be a summary meeting to consider the draft plan, comments received, and proposed next steps. The meeting is tentatively set for Tuesday August 7th at 5:30 PM in City Hall Council Chambers. At this meeting we will also be seeking lighter, quicker, cheaper engagement ideas that can perhaps be tested or displayed at future Third Thursday Events with the collaboration of the DSA. Show us what you see in downtown! Photo Voice is all about showing what YOU experience in downtown Sheridan. Each person provides TWO photos and a BRIEF explanation to answer two questions. What does a successful Main Street look like to you? Take this super quick survey! Have you experienced a “close call” and narrowly avoided an accident while walking, bicycling or driving on Main Street? Use our interactive map to show and tell.